Going to the store is always a challenge with little kids. But, I do it anyway. Yikes. I must be a masochist. 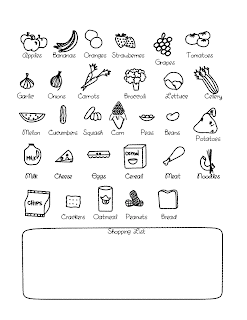 Although the worst part, for me anyway, planning a menu and making a shopping list. So, I thought this little shopping list might help. My girls can either color the things we need at home, and then check them off when we get to the store, or take a crayon or two with them and color them when I put them in the cart. I haven't tried it yet, so I'll let you know how it goes. It obviously can't have everything on the list, which is why there's a space for extra things or extra pictures for the kids to draw. I have my fingers crossed. Here's hoping! 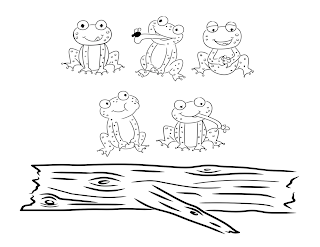 Five little speckled frogs sitting on a hollow log, Eating some most delicious bugs. Yum, yum! One jumped into the pool where it was nice and cool. Now there are four green speckled frogs. Four little speckled frogs sitting on a hollow log, Eating some most delicious bugs. Yum, yum! One jumped into the pool where it was nice and cool. Now there are three green speckled frogs. Three little speckled frogs sitting on a hollow log, Eating some most delicious bugs. Yum, yum! One jumped into the pool where it was nice and cool. Now there are two green speckled frogs. Two little speckled frogs sitting on a hollow log, Eating some most delicious bugs. Yum, yum! One jumped into the pool where it was nice and cool. Now there is one green speckled frog. One little speckled frogs sitting on a hollow log, Eating some most delicious bugs. Yum, yum! He jumped into the pool where it was nice and cool. Now there are no green speckled frogs! Some of the coloring pages can be made into what I call "felties". Basically just the things that stick to felt boards. In case you don't know how to do that, here's how! You can also put magnets on the back after you've laminated them and well, make magnets. I like to use the free ones businesses give out. Sad but true ;) Enjoy!